Dollar General, online at dollargeneral.com, is the shopping destination for big savings on a wide variety of everyday items. Dollar General helps customers save time and money, while offering school and office supplies, household essentials, cleaning products, canned goods, cereal, food goods, health and beauty products, electronics, apparel and accessories, baby care products, toys, seasonal products, gifts, and lots more. Dollar General also offers loved brand like Hanes, Folger's, Energizer, Bic, Crayola, Barbie, and many more. But before you shop, be sure to get all the latest dollargeneral.com discounts, Dollar General promotions, and Dollar General coupon codes found here at RetailSteal.com. Dollar General offers shipping within the United States, Alaska, Hawaii, P.O. boxes, and APO/FPO addresses. Expedited options are available. Some restrictions may apply. See site for more details. Save $20 on your purchase from Dollar General Supply. Click here to shop and use coupon code to save on bulk purchases over $100. Get free shipping on your purchase from Dollar General. Enjoy discount with purchases $40+. Shop at Dollar General and enjoy $20 savings on orders $100+. Click here for code. Save up to 15% on select home cleaning products from Dollar General. Click link now to shop and save on Windex, Clorox, Scrubbing Bubbles, and more. 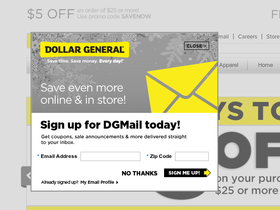 Shop at Dollar General and enjoy free shipping on orders $30+. Click here for code. Enjoy an 11% discount on coffee and tea from Dollar General. Click here now to shop and save.